Innovation in science and technology ties directly to the transfer of knowledge and distinct learning strategies. In many ways, scientific advancements are both the outcome and the foundation of ongoing research and development of breakthrough products and techniques. Welcome to an interview with Sofia Khan, NonLinear Seismic Imaging.In it, she describes her goal to help develop a new method of imaging fluid-saturated reservoirs in the subsurface. 1. What is your name and your interest in geophysics? My name is Sofia Khan and my interest relates to the application of science to better understand the true nature of fluid-saturated hydrocarbon reservoirs in the subsurface. I was introduced to cutting-edge concepts in direct reservoir imaging over ten years ago and am now more involved in the development of a way forward that could help solve many of the existing and future complex challenges faced in hydrocarbon exploration and production. In general, we all want to solve and create a viable and cost-effective method to map oil and hydrocarbon accumulations underground, enabling us to produce more oil from existing reservoirs and from reservoirs not mapped so far using the current subsurface imaging methods. Any useful knowledge shared, improvement or breakthrough in that regard is a contribution and benefit for the entire industry and more importantly for the world's energy supply - the impact of what we strive to achieve is far beyond our role within our own companies. The ongoing effort to introduce new ideas can take decades before widespread acceptance and implementation, if we can patiently persist in that tireless effort. Through the work of our company and others like the Los Alamos National Laboratory, it has been shown that reservoir rocks can be better mapped when we realize that the fluid-saturated, porous and permeable rocks exhibit “dynamic elastic nonlinearity.” The reservoir rocks of interest are complex and heterogeneous and contain a variety of mesoscopic structural features (cracks, voids, joints, grain contacts) with different elastic properties specific to their structure. The voids and cracks are filled with multiphase fluids that are under pressure. The fluid pressure couples to the mechanical effects of an externally applied seismic signal that creates stress or strain cycles. The reservoir fluids, which are an integral part of the reservoir rock, have different physical and elastic properties. The elastic properties of the reservoir fluids - according to oil, gas, and water content - vary due to the changes in their viscosity and behave differently during load and unload cycles of a seismic wave. The result is that a reservoir rock behaves like a complex configuration of tiny springs connected to each other in series and parallel combinations, each one of them behaving nonlinearly. Research work on dynamic elastic nonlinearity of rocks carried out in Los Alamos and Stevens Institute of Technology establishes a relationship between measurable nonlinear parameters and the physical characteristics of the porous rocks, and further establishes that the elastic nonlinearity of the rocks directly relates with effective porosity and the pore fluids. What differentiates reservoir rocks from other sedimentary rocks is that the reservoir rocks have effective porosity, fractures and pore fluids. Subsurface imaging methods that will directly focus on these differentiating characteristics of the reservoir rocks and highlight them against the other subsurface formations will provide us with direct hydrocarbon detection capabilities. When body waves propagate through the reservoir formation, they disturb the equilibrium state within the reservoir that exists, between the pore fluids and the rock matrix. Shear waves, due to their propagation characteristics, show less sensitivity to the pore fluids. However, the compressional wave and the Slow Wave or Drag Wave™, which effectively move the pore fluids with respect to the rock matrix, behave differently and generate elastically nonlinear attributes. These seismic attributes related to the propagation characteristics of the P-Wave and Slow Wave are more sensitive for mapping reservoir properties compared to the currently used seismic attributes which relate to velocity, attenuation, and modulus. The Nonlinearity Component, which is generated due to the relative movement of the fluids and the reservoir matrix, is caused due to hysteresis effects of the fluid movement. This effect is more pronounced for higher viscosity pore fluids like oil compared to gas or water. Due to the dependence of elastic nonlinear parameters of the rocks on the porosity, permeability, and pore fluids, elastic nonlinearity measurements are best suited to map the in-situ reservoir properties. For most practical purposes, the nonlinearity parameter directly correlates with the ratio of the amplitude of the harmonics generated or the sum and difference frequencies generated, to the amplitude of the fundamental primary input signal. I recently read something that reminded me of the importance of empirical data – that science requires only one investigator who happens to be right, which means that he or she has results that are verifiable by reference to the real world. I bring this thought into my dialog because we have faced a lot of resistance to a new idea in the area of geophysics, for reasons that are not always rational or fair. If we can overcome all the disagreement and focus on the empirical data, perhaps we will all gain from the new ideas. It might be considered radical or controversial, but we owe it to the industry to take a second look at the fundamentals of seismic imaging to advance solutions for more rigorous challenges that lie ahead. We should boldly go to the oilfields and try out each new idea without hesitation, like the pioneers of previous generations did to come up with answers they wanted to obtain. There was little hesitation or doubt involved, rather there was almost immediate support and interest in every idea. At present, only the contribution of the reflected primary seismic signal is being used and the new frequencies generated due to elastic nonlinearity of the reservoir rocks are ignored by the geophysical industry. The Nonlinearity Component, in the form of new frequencies different from the input signal, once acknowledged, will provide a powerful tool to map the reservoir properties not previously mapped using the current seismic methods. Another assumption made by our industry is that the contribution of a newly generated seismic wave in the reflected and refracted signals from a porous and permeable rock formation is negligible and can be ignored. Using current conventional data processing, which does not realize the existence of this wave and does not account for its lower velocity in the reservoir rocks, its reflection is mapped as a ‘shadow’ or ‘ghost’ of the compressional wave reflection. This is an artifact created by the lack of understanding of actual behavior of seismic wave propagation in porous and permeable reservoir formations. In reality, reflected and refracted signals from a porous and permeable rock formation have two components. Part of the propagating energy is reflected and refracted from the rock matrix and part of the energy is reflected and refracted from the pore fluids contained in the rock formation. Throughout the published scientific literature, the compressional energy in the permeable rocks, which travels through the pore fluid interconnections in a tortuous path, is known as Slow Wave because its velocity is slower than the fast compressional wave. Slow Wave, as defined by known literature, is diffusive and highly attenuated therefore difficult to measure in-situ in reservoirs. “Drag Wave™” is a form of Slow Wave in that its velocity is also measurably slower than the fast compressional wave. This Drag Wave can propagate over long distances through and across the entire reservoir because it is generated by the solid/liquid coupling as the fast compressional wave propagates through a rock that is permeable, porous and fluid-saturated. Imaging this unique signal that is generated by the slower compressional wave only in the rock which is permeable, porous and fluid-saturated will directly identify the hydrocarbon accumulations. 2. What is your new product? The industry has been looking for some form of seismic attribute which can differentiate the hydrocarbon-bearing rocks – those that have porosity, permeability, fracturing, and are saturated with pore fluids – from all others. Nonlinear Seismic Imaging Inc. introduced a new concept of imaging certain important seismic attributes of the reservoir rocks - not previously addressed by anyone when we began our journey. This technology is proprietary and protected by a number of U.S. Patents. 1. When a seismic compressional wave propagates through a reservoir formation it generates harmonics of all the primary frequencies that are present in the seismic signal. 2. When there are more than one seismic signals propagating through the reservoir formation simultaneously, the sum and difference frequencies of the two primary waves are created, and that is a unique property of the reservoir formation. 3. During the propagation of the compressional wave through the reservoir formation which is permeable and fluid-saturated, another seismic wave is created which is identified as the Slow Wave or Drag Wave™. The Slow Wave travels at a lower velocity than the velocity of the compressional wave in the mineral frame of the rock, or the velocity of the compressional wave in the fluid that saturates that reservoir formation. This phenomenon creates a very low frequency wave that will only be present in the reservoir formation and not in any other subsurface rock. Nonlinear Seismic Imaging technology, in the form of proprietary acquisition and processing methods, uses these three main characteristics to directly map the presence of hydrocarbons in the subsurface formations. To successfully achieve the desired results, the seismic data acquisition has to be specifically designed so that these seismic attributes are created and preserved for further analysis and interpretation after the seismic data have been processed. Without the proper data acquisition, these unique attributes cannot be usefully extracted during the data processing, and we will not get the desired image to identify the presence of hydrocarbons. In essence, Nonlinear Seismic Imaging will change the way we think about the hydrocarbons by focusing on directly mapping the reservoir rocks. We need a method that maps the seismic signals being generated only in the reservoir rock which is fluid-saturated – mapping these signals will identify the formations of interest and all other rocks are invisible in the Nonlinear Seismic image. To find and produce the oil that has been left unproduced or undiscovered, industry needs a scientific breakthrough that can provide Direct Reservoir Imaging, a new way to directly map the reservoir fluids and identify oil and gas accumulations, rather than map the geometry of the subsurface structure and use that information to infer the oil accumulations. Industry needs a technology that will illuminate the oil reservoir like an MRI illuminates one chosen part of the human body, and ignores the rest. The unique contribution of Nonlinear Seismic Imaging acquisition and processing methodologies is that they provide a method of differential illumination of the subsurface formations that are of greater interest to the hydrocarbon producers. Clays and shales are normally less porous, more homogeneous, and behave more linearly in comparison with high porosity sandstones and limestones. As a result, shales and clays themselves generate a weaker ‘nonlinearity component’ and show less prominent amplitude response on a nonlinearity seismic section. Yet, the main advantage of this technology is that fractured and complex reservoirs will be mapped with greater definition than any conventional seismic method can, irrespective of the number of channels used in the acquisition systems being offered today. Hydrocarbon-bearing shale would be a prime target to identify the sweet spots since the shale has been deposited in horizontal laminations, and the hydrocarbons captured between the laminations provide the same anisotropic response as the horizontal fractures. The shale, because of the laminated effect of its deposition history, would become highly nonlinear to a vertically propagating seismic wave – and will give us a strong nonlinear response. We have proposed that new reservoir characterization methods should be developed by using the elastic nonlinearity parameters of the reservoir rocks and their correlation with the reservoir properties. Seismic wave propagation through fractured or porous and permeable rocks generates new frequencies not originally present in the input signal. 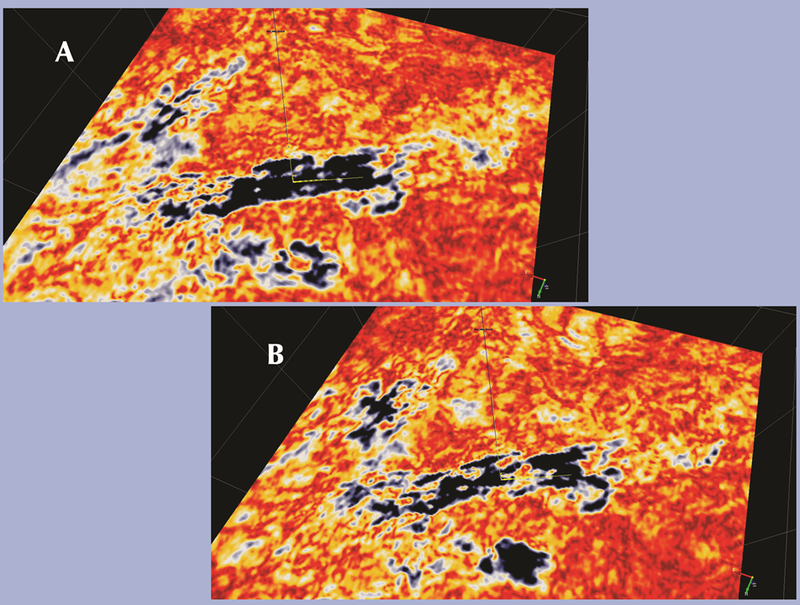 Seismic images created using the newly generated frequencies provide unique information related to reservoir properties at very little additional cost to the oil company. Nonlinear Seismic Imaging methods enable the end-user to retain the conventional linear seismic images and provides additional seismic images that will go further to identify the porous and fractured reservoir rocks – and this is where the oil and gas will be located. In areas where the current seismic fails to map the stratigraphic or fractured hydrocarbon traps, Nonlinear Seismic Imaging technology can provide the useful reservoir information so that reservoirs that are invisible to current technologies can be discovered. Carbonate reservoirs are a prime target for this technology, since their porosity and permeability quite often does not correlate with the structure or the linear measurements of velocity and attenuation. 4. What need does it meet? - Can we map the reservoirs that are caused by stratigraphic traps that we are unable to map using current technology? - How do we map the unique signals that are being generated in the reservoir rock when the compressional wave propagates through it? - If there’s a deeper zone, can both zones be mapped simultaneously? - Will the presence of the Slow Wave generate a unique and independent signal that will identify the reservoir? - If there is no acoustic impedance contrast between the reservoir and other non-reservoir sedimentary rocks, can this technology be used to identify and map those formations? - In the case of a marine environment, how do we certify and ensure that we have highlighted the seismic anomaly which is porous and fluid-saturated? - To eliminate the cost of drilling dry wells, how can we map the porosity profile of an existing or potential reservoir? - In order to understand the flow patterns between the wells and between the reservoir facies for accurate reservoir simulation, how can we map the permeable units of the interwell space? - How can we map the changes in the reservoir pore fluids that are caused due to production and injection processes; can we accurately monitor the fluid fronts? In spite of all of our efforts to date, the quest for direct reservoir imaging has not been fulfilled. From the time when we used the “divining rod” or relied on surface anomalies to find the drilling location, to the present day when we rely on advanced seismic imaging to locate oil and gas accumulation – the goal has been elusive. The current technologies have come a long way during the last hundred years; we can map the subsurface geology of the sedimentary rocks with a higher resolution. However, there is no technology which exists that can help us in directly locating the hydrocarbon accumulations with any level of certainty. One of the critical elements of oil exploration is to identify the geologically favorable areas around the world where commercial oil and gas accumulations can be found and exploited. Seismic subsurface imaging methods are being used in geologically favorable areas to image the subsurface strata. During the last two or three decades, tremendous progress has been made in improving the resolution and the reliability of the seismic results. Based on the seismic images, the potential geologic traps that hold viable oil and gas accumulations are identified. At present, the interpreted results of the various geologic traps that can accumulate hydrocarbons can only be validated by the drilling results. The current seismic, in spite of all the recent improvements, fails to directly map the hydrocarbon accumulations. The existing reservoirs dating back to those discovered many years ago still contain substantial remaining quantities of oil and gas in a conventionally movable state. The volume of residual oil in the existing reservoirs is large. There is a strong correlation between the unrecovered reserves with the geologic heterogeneities of the reservoirs. Over the past almost three decades, industry has applied different methods of enhanced oil recovery (EOR) and improved oil recovery (IOR). In most cases EOR or IOR have proven to be expensive and have had limited success. Generally the limitations do not seem to be in the efficiency of extraction techniques, but rather in the ability to correctly deploy such technologies in geologically complex reservoirs. Since most of the conventionally movable oil and gas potential lies in geologically complex reservoirs, the breakthrough reservoir imaging technologies will be chiefly responsible for improvements in producing the extra reserves. It is highly probable that more subtle hydrocarbon accumulations in stratigraphic traps have been left behind, since the current technology can only map the subsurface rocks and fails to directly map the subsurface hydrocarbon fluids. Today, what is needed is the development of a new technology that will provide a new seismic approach that will allow us to map the reservoir porosity profile, permeable flow units, location and orientation of fractures, and the distribution of different viscosity pore fluids. In addition to the standard 3-D image provided by the current imaging methods, each one of these critical parameters would be mapped and displayed individually in three dimensions. Hydrocarbon reservoirs are heterogeneous and complex in terms of porosity, permeability, fracturing, lithology, pore fluid saturation, and distribution. Knowledge of these reservoir parameters and their spatial variation is critical in the evaluation of the total volume of hydrocarbon reserves in place and how these reserves can be extracted economically. 5. What makes the technique advantageous? We directly image the unique signal that is being generated in porous, permeable and fractured reservoir rocks, and not being generated in other sedimentary rocks. As an end product, we will directly identify hydrocarbon accumulations and simplify the exploration effort. There are several techniques we can utilize and they will depend on the challenge that is faced in the particular field location and geologic condition. These methods can be implemented using all of the existing equipment already known throughout the geophysical industry, such as Vibroseis trucks, impulse sources, marine streamers, ocean bottom nodes and cables etc. Recently, we have come up with a new, different approach to identify reservoirs with the “Direct Reservoir Signature using the Drag Wave™” – and feel confident that the industry will recognize its value. The reservoir properties of interest are porosity, permeability and the identification of the pore fluids. In large exploration programs when the data volume can become overwhelming, the industry needs a method which will identify more promising leads that will direct the explorationist to focus on the areas which are more likely to be commercially viable. This patent is designed to address that shortcoming by using simple acquisition and data processing methods to locate the subsurface reservoir formations that will provide more commercial and beneficial returns. This patent would be extremely useful for reconnaissance work in unexplored areas of the world and in those areas where the conventional seismic has been unable to map and locate new reservoirs. You might consider it as a “Step One” when using this technology. In particular, no additional Vibroseis equipment will be required to implement the method; we’ve created the invention to be effective for the most difficult-to-access areas where the operations are increasingly expensive. One of the main advantages of this new method is that the lower frequency generated due to the Drag Wave is totally unique and cannot be mistaken by the harmonics or the interaction of frequencies, and this lower frequency becomes a very reliable indicator of the presence of subsurface reservoir formations. This Drag Wave™ invention will also reduce the cost of drilling dry wells because a simple test using this technology will either confirm or decline the presence of reservoir rocks, thus avoiding not drilling any wells where this newly generated lower-frequency signal is not present. This invention will reduce the cost of exploration and improve the success ratio, and can easily be implemented with the current seismic equipment and the current practices using seismic imaging at present. The work has been done to understand dynamic elastic nonlinearity; the methods have also been devised to take advantage of the science so that we can advance the effort in hydrocarbon exploration. I would like to achieve the implementation of this technology as we advance into a world of changing demographics – increased population and more demand from developing economies throughout the world. Using the new Nonlinear Seismic Imaging technology, opportunities exist to improve results in oilfields both onshore and offshore. Taking this approach, the risk is minimal to the operators. With intelligent planning and proper implementation of simple techniques, it would be nice to have a successful outcome for everything that has gone into this effort so far. Using the technology is not capital intensive, so the rewards will be directly related to the exploration efforts of the oil companies. I am currently exploring how to achieve global implementation of this technology – in a step by step process. There are no easy answers so far, but I am hoping that we will find a champion in the industry that believes in this approach and decides to move forward with us with a full, dedicated commitment.